Colour Therapy Family Time at Eau Brink Studio today. What on earth does that mean I hear you say? As a family it can be hard to all get together to do something that can encourage creativity. Something that the entire family can do. Today a family came to Eau Brink Studio to work with colour. The tricky bit is working out your personal colours. Once done it is just a case of using them to create texture and line using a variety of implements. The youngest member of today’s group was 10 years old who became very excited when she realised that just by taking a rubbing and washing it over with a gold ink you can create something beautiful. we also had teenagers and parents. It was a fabulous day watching the nervousness disappear as they became involved in the art. Some of it was drawing, some painting. We had textures with printing and stitching free motion for the first time. 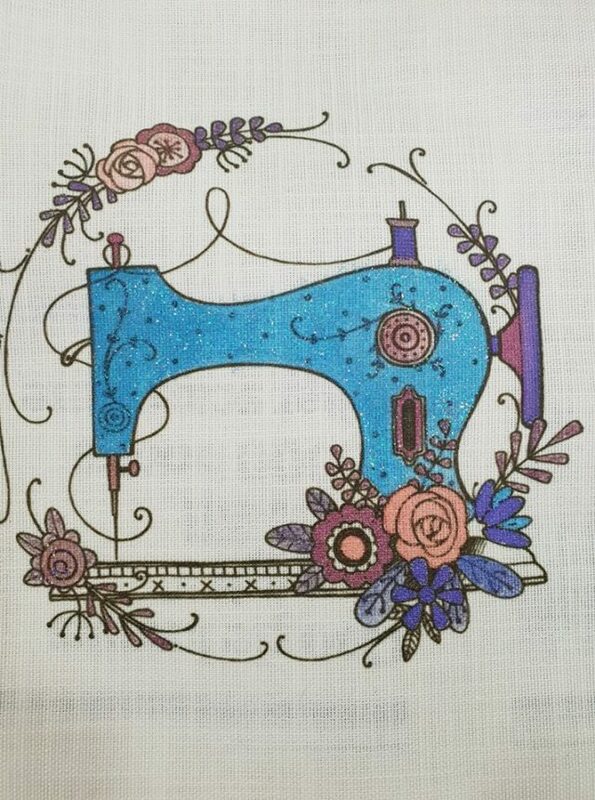 A spectacular result on the sewing machine. Just goes to show what can be done with an very old Bernina and a little imagination. As you can see this is a very talented family. This drawing took a while as the young lady wanted to ensure she managed to get her drawing to look proportionate. For one so young it is a great piece. By the afternoon they entire family had managed to get a number of pieces finished. I love the colours in the eye. 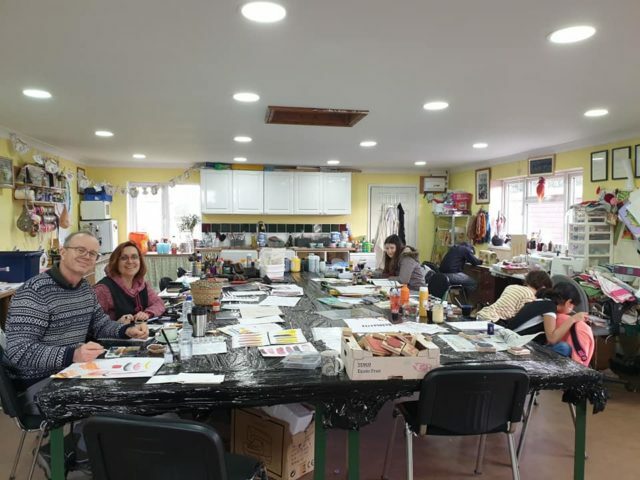 Mum and Dad worked through a number of different ideas ranging from printing to watercolours. All with brilliant results. Looking forward to the next Colour Therapy Family Time just to see what they turn out. 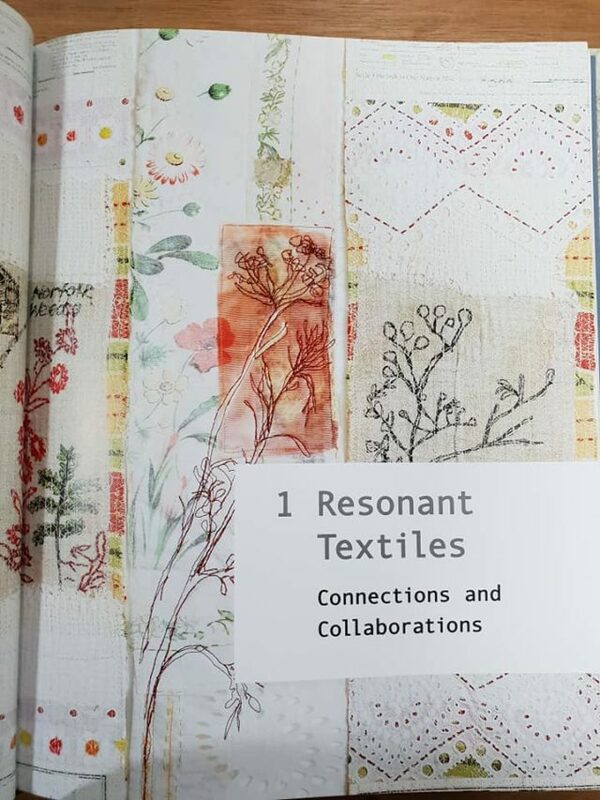 This coming weekend is all about Textiles East Fair at Swavesey College. For Eau Brink Studio that means a few items I have not had to sell before and am excited to present them to you in this blog. Aslo I will have some of my Lincoln Longwool for you which I have carded and in some cases blended with Alpaca. I am hopeful that I will be able to get a delivery from Clover Products in time but as I have been out of action last week I cannot guarantee I can get them. The plan is to give you access to items that we all like to use in the studio. Things like the chalk pens (Clover have new refillable ones). And a few more of their fabulous gadgets too. If I cannot get them in time just leave me your email address on the day and I will add you to the emailing list so that you get to know what comes in before anyone else. Also you can let me know if you would like me to try and get items for you but I will only be using the suppliers that I already buy from for the workshops. Alternatively pop over to my website and sign up for the news letter at https://www.eaubrinkstudio.co.uk/ scroll down the home page and you will find a subscribe link to complete and you will be kept informed a little quicker than leaving it to the fair. The most exciting thing I will have is the fabulous Cas Holmes Books. I have been sent a limited supply at the moment as they are being reprinted in some cases. Here are a few teaser pictures and yes I will have copies for you to look through before you buy. The rest will be wrapped to keep them pristine for you. I love the feel and the look of this book. the pages give you snippets and insights into Cas and Anne’s world and work. there are discussions on collaboration, exercised and tips for you to follow. And a way to use mark making to create your own art. 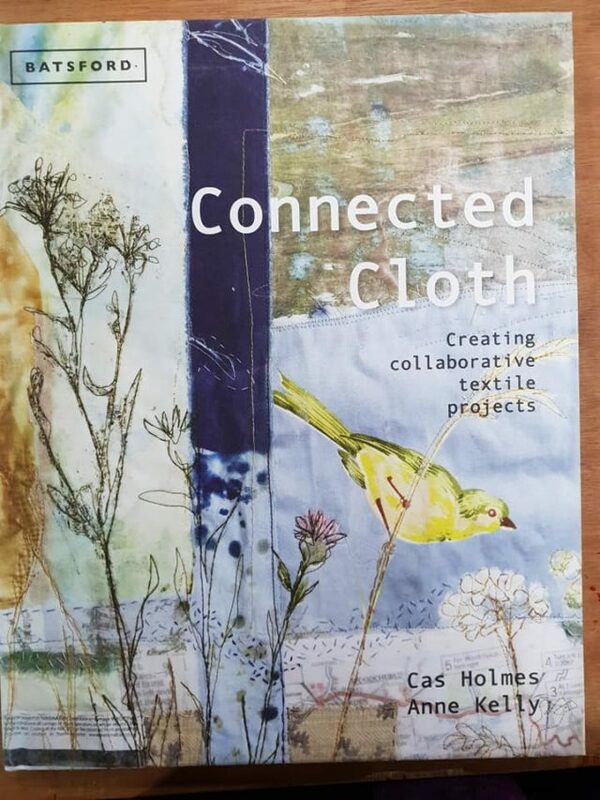 Another book by Cas that gives the reader a great deal of information on how Cas gathers her inspiration and using it. Cas also discusses other artists in her book. It is interesting to see many textile artists who trained in fine art first. 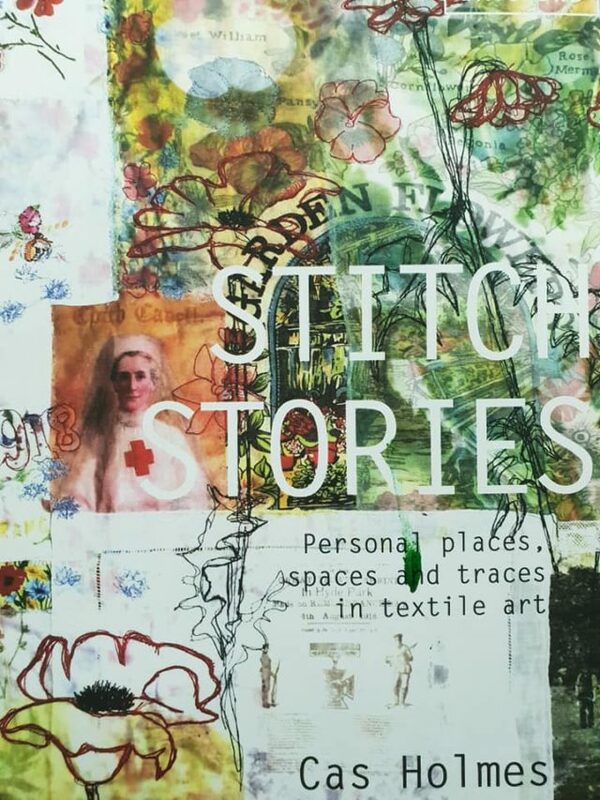 Here we have the last book Stitch Stories. 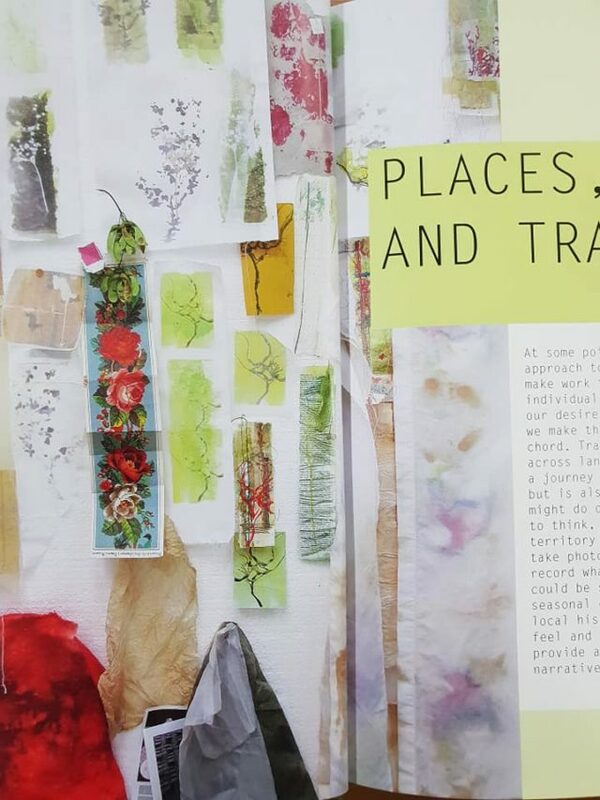 It is beautiful, colourful and full of information to help you with your textile journey. The bad news is that I at this time only have four copies of one book, three of another and only one of another.However, I am not going to tell you which is which. I will also not be able to reserve copies as they are so limited at this time. On a more personal note, we are looking forward to April for another reason. Our lovely Lincoln Longwool girls will be delivering their lambs during that month. An anxious but exciting time for everyone. When you visit the studio make sure you go and see them. I will welcome you feedback on the carded and blended Lincoln Longwool I am bringing along to the fair. Take a look around you and see all the inspiration you can use for your particular type of art. What do you see? colour, texture, light, shadow, look past the image your mind is telling you is there. Yes I see trees when I look out of the window. However, a tree has many different colours depending on the type and daylight. the textures change with the seasons along with the colours. Look at the lines and think about how they are different each time you look at the trees. That is how I see my world. Try it for yourself for only five minutes each day. A whole new world opens before you. How do interpret this into art? Feel how it should be, block out your image of the tree and think and feel it. Think of the way it feels when you touch it, it could be smooth or rough, does it shine as it is wet? is it cold? We assume fir trees are spiky but they are not all sharp needles some of them are soft when you feel them. If your tree is a sliver birch then you will feel many different things from a smooth trunk to a papery peeling trunk. And you can do a lot with that paper thin bark that peels off. 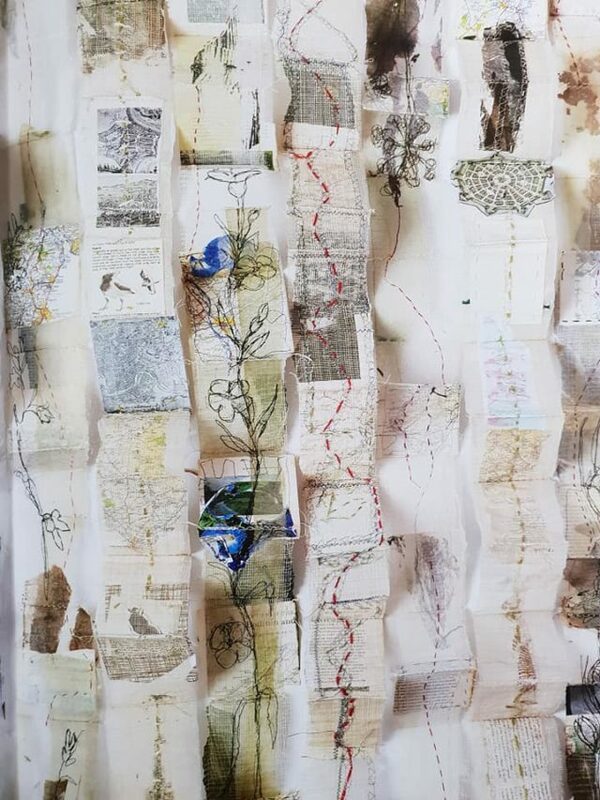 Then as you get into the feeling of the piece look at what medium you want to use, fabric, paper, music, paints it does not matter what it is as you will create something beautiful from that inspiration. Some of you may think but when I do this it does not look like the tree. That is the point. If you want it to look like a tree take a picture and you will have that visual for ever. Feel it and create it and it will mean a whole lot more than the flat picture, as you have created a representation of the feelings the tree invoked in you. Textiles East on Friday 22nd and Saturday 23rd February at Swavesey Village College, Gibralter Lane, CB24 4RS. from 10 am each day. 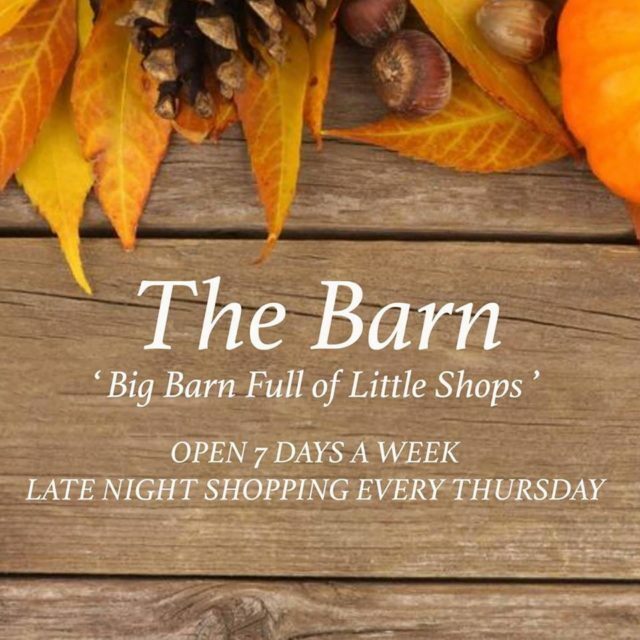 Anita will be at The Barn, on Tuesday from 10am till 4pm if you fancy popping over to Long Sutton. there is a great coffee shop that sells very scrummy food too. Embroidery Mondays are a new pop in day where you can get help with your sewing or just come and enjoy the day with like minded people. Only £10.00 but you can purchase materials if we have them in stock. Let me know in advance if you want something and I will try and get it at a reasonable price for you. Good and Bad? This is a loaded question. Can you be honest and answer it? I will try and for those of you who find yourself reading this perhaps you can let me know if I have been honest in this blog. Starting with what I am not so good at. Or as the question says Bad. Selling is my weakest point for my business. Mad I know but true. I am not a sales person. I am a creator, I can get very passionate about creating but not about selling. Selling is easy for some individuals and they can sell anything to most customers. But I find that I cannot get my enthusiasm for what I do across to a new customer. In fact sometimes I find just describing what I do to someone difficult. And why is that I hear you ask. Well that is because my work is very visual and tactile and trying to get that across is not easy. 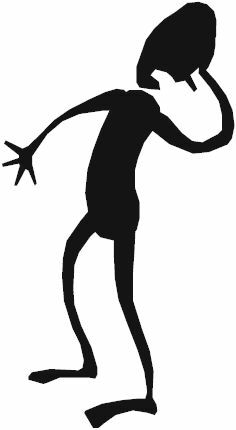 I know that once I engage with a customer and they get what I am saying the next step is to convince them they need to attend a workshop to feel that excitement of creating something new, Learning a new skill, or just to come and have a go. The thrill of engaging with a new way of expression is something you need to experience before you can decide if it is for you or not. But fear gets in the way for many customers as they think they cannot do it. But guess what you can. And for me that is the same will selling. I am learning from my lovely customers what it is they want and I am reading a great deal on the subject and have found that so far I need to be able to break down each component of my business to be able to sell it to customers who are interested. Teaching is my strongest point for my business. Once a new customer has booked onto a workshop I am able to encourage them to produce a great piece of work. It does not matter what type of item they are learning or what medium they are using, I can get give them the confidence to finish an item. For some they need a step by step approach in the beginning and then they will look at what they have achieved and want to move it onto the next step. 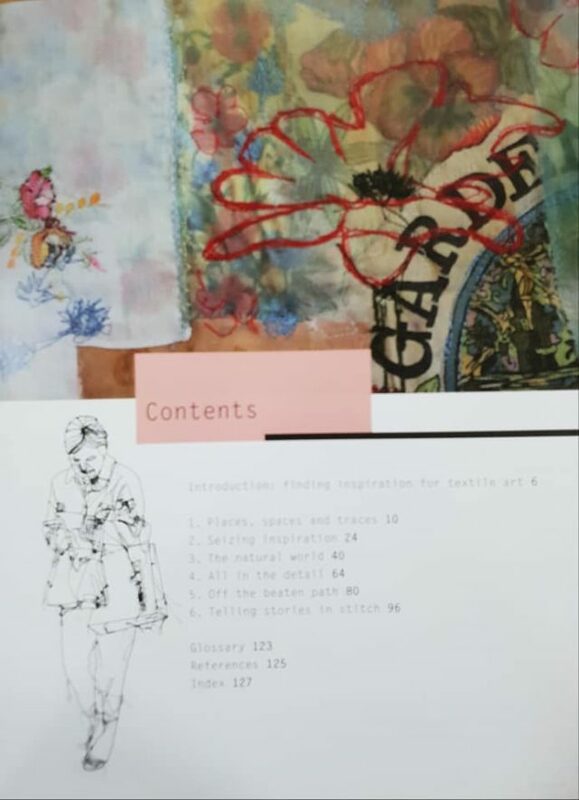 For example, learning how to layer fabrics to create texture and colour using sheer fabrics and stitch. Others just need to be encouraged to explore what they can do with the medium they have chosen to work with. For example, if you wish to layer up fabrics with stitch and want to bring the layers through what would you do to show them? cut the top layers back? or burn them to add extra interest? Colour is another thing of fear for some but it does not have to be. colour charts show you what to put together. If you wish to be creative audition your colours to see what pleases you and don’t be worries about what other think. The one thing I can assure you all is that I am always learning. Not just from books and the internet but also from the other artists who visit the studio. But most of all from my customers. Though I have to say with one group of ladies it is not always learning about our art. You know who you are. Wednesday 6th and 20th February is Experimental Wednesday.